The Friends of Bride’s Mound were formed in November 1995 to preserve, protect and enhance the land known as Bride’s Mound and the immediate environs by keeping the natural simplicity of this special place open to the local community and visitors. The Friends of Bride’s Mound were formed in November 1995 from dedicated volunteers. To preserve, protect and enhance the land known as Bride’s Mound and the immediate environs by keeping the natural simplicity of this special place open to the local community and visitors. 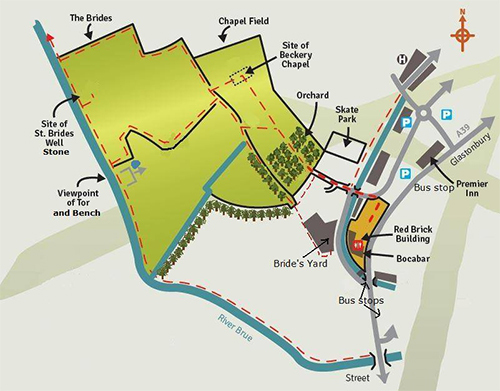 In 2000 Friends of Bride’s Mound gave evidence at the Public Inquiry for the District Local Plan, establishing that the whole Chapel Field was outside the Morland’s development limit. The Inspector supported our intentions that this place would be respected for its spiritual significance and that any use of the site failing to respect the setting of the Chapel would not be allowed. In 2005 Friends of Bride’s Mound purchased three fields, i.e. twenty-five acres of land, known locally as ‘The Brides’, which included the Ridge which forms part of the western end of Bride’s Mound. In 2009 Somerset County Council became the owners of the Chapel field. They are liasing with us over the management of the Chapel Field. After many years of neglect, this land is responding to the love and care from Friends of Bride’s Mound and now Somerset County Council, and is once again taking its rightful place in the Glastonbury landscape as the western gateway to Avalon. The goalposts may have changed over the years but our mission remains the same. 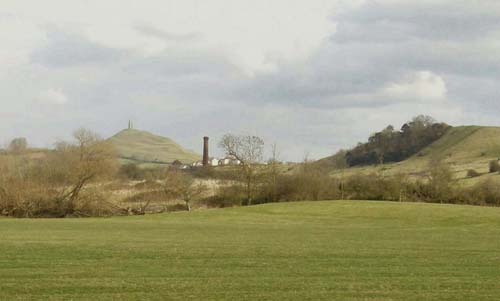 Bride’s Mound is a small hill to the west of Glastonbury in an area called Beckery island, close to the site known locally as ‘The Morland’s Site’, an abandoned sheepskin factory. This area is in the process of being redeveloped and regenerated. Bride’s Mound is situated near the outlying end of Wearyall Hill, just off the opposite side of Street Road. It can be reached by Bus Nos. 29, 37, 375 and 377 from the Abbey Car Park bus-stop on Magdalene Street, getting off at the Moorlands bus-stop by Beckery Enterprise Park. FUNDRAISING PROJECT - “The Swan Circle – The birth of a new stone circle in Kings' Meadow, Worthy Farm, near Glastonbury.” By Ivan McBeth. This 2016 edition has been updated by the author, who has given permission for the booklet to be sold for the Friends of Brides Mound. The original was published in 1992, the year the stone circle came to life. Ivan also talks about it on his website. In this book you will find the original drawings of the layout of the stone circle, now a well known landmark at Glastonbury Festival in Pilton, Somerset and the story of how it came into being, as well as how it was built and what it took to get it finished on time. The references to sacred geometry, astronomy and astrology are intriguing; the diagrams fascinating. Ivan's account is very honest, with magical and personal insights, that draws us into the whole experience and has made me want to go and visit the Swan Circle again with new eyes (and the book as reference in my pocket). 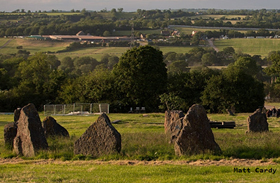 If you decide to visit the stone circle yourselves, please follow the public footpaths. However you will need a ticket to the festival to visit it at sunrise on Midsummer, until there is a fallow year, the next one is 2018. Maybe see you there!